Happy Friday! We our closing out the first full week of the Nordstrom Anniversary Sale Public Access, and I wanted to share one of my favorite fall looks featuring a few of my sale favorites. Every year, I buy one splurge/investment piece. I feel one of the overlooked parts of this sale is that it’s a really great time to buy those expensive designer brands and investment style pieces at a great discount. It’s usually still a splurge price, but something to think about when you shop the sale. These Stuart Weitzman boots were my investment purchase this year. I have been dying for a pair of boots from this brand for a few years. I fell in love with these when I saw them in the catalog that comes out a few weeks before the sale. I then spent the next few weeks over-contemplating making these my big purchase. After I saw them in store, I knew they were it. Ya’ll I’m so in love! The heel height is only 3 inches, which if you’ve been following the blog for a while you know is low for me 🙂 , but it’s a good boot height. 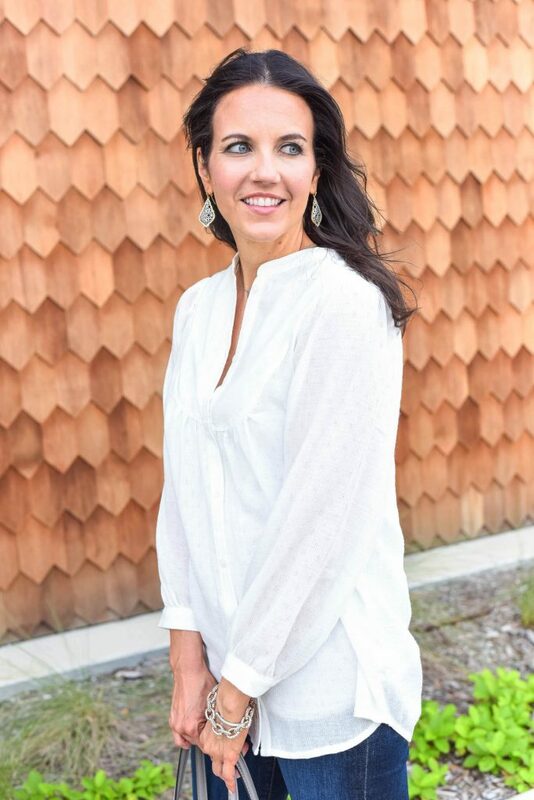 I love the slouchy fit, and the color is neutral perfection! I plan to wear them with jeans and dresses in the fall and winter. I also added a few more pairs of denim this year. I dropped a size and needed all new pairs. I went with these from Joe’s Jeans as my dark denim pair. The other pair I have from the last sale held up well and haven’t faded. This pair is so comfy, and doesn’t over stretch out. I will need to have them hemmed slightly (which Nordstrom does for free for cardholders). For $99 though, it’s a really good jean. I like to add a few basic style tops each year. 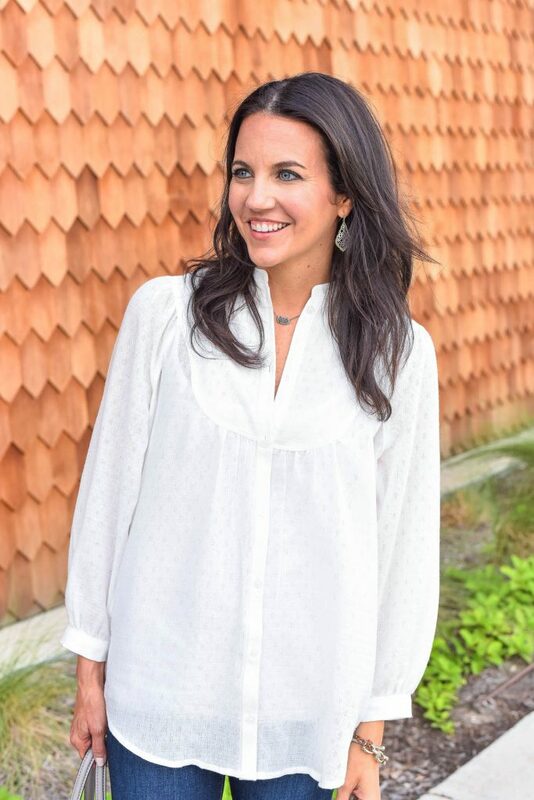 A flowy white top can be styled and restyled so many different ways, so always a good basic to pick up. I love the lightweight material of this one, so I can wear it on warmer fall days and during the spring. 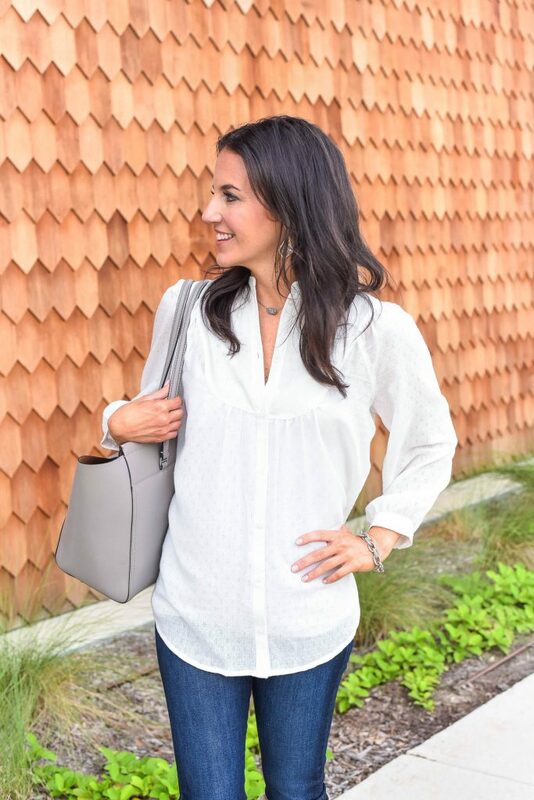 All these pieces are such basics, but come together to become such a classic, chic, and casual fall outfit. If you are still shopping the sale, don’t ignore those closet basics! Check out my try-on session to see more of what I purchased. Also, I’m co-hosting a $400 Nordstrom Giveaway here! Thanks for stopping by ya’ll and have a great weekend! I love this look, Karen! 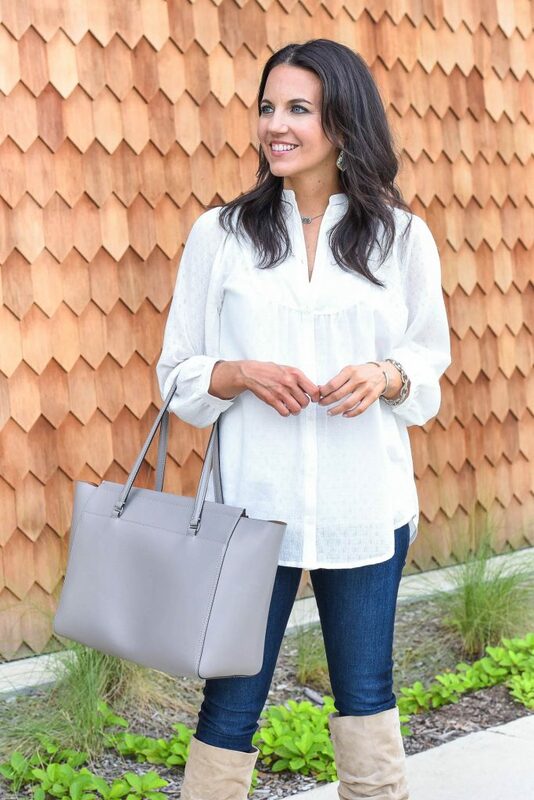 I’ve been on the hunt for a tunic top like this and I LOVE yours! I’d love for you to join our link up today! I love this fall outfit on you. I especially love those boots. Yeah I do prefer higher heels too. Personal preference 4 inches plus.